In front of supplies sent with packages from various parts of the main island of Japan, Shinji Isa of the Association of Residents Against the Helipad (right) delivered a message in front of the N1 zone gate to the U.S. military’s Northern Training Area in Takae Ward, Higashi Village on July 24. The Japanese government has resumed helipad construction in the U.S. military’s Northern Training Area (NTA), which expands from Higashi Village to Kunigami Village. Citizens protesting against the construction have long received supplies such as food from various areas in the main island of Japan. Since the central government removed vehicles and protest tents set up there, shut down the N1 zone gate to the NTA and brought in construction materials on July 22, the protesters have received further supplies. 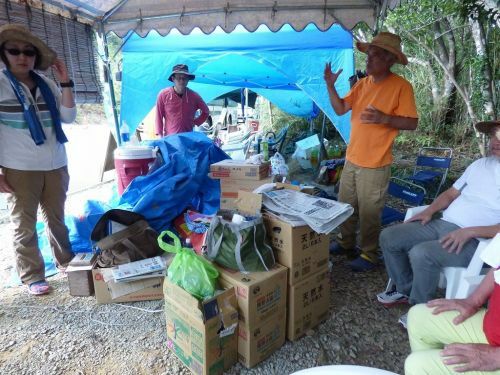 Members of the Association of Residents Against the Helipad said they appreciated the extra supplies and were encouraged by the support from outside of Okinawa.